This protocol describes the use of multiphoton microscopy to perform extended time-lapse imaging of multicellular interactions in real time, in vivo at single cell resolution. Harney, A. S., Wang, Y., Condeelis, J. S., Entenberg, D. Extended Time-lapse Intravital Imaging of Real-time Multicellular Dynamics in the Tumor Microenvironment. J. Vis. Exp. (112), e54042, doi:10.3791/54042 (2016). In the tumor microenvironment, host stromal cells interact with tumor cells to promote tumor progression, angiogenesis, tumor cell dissemination and metastasis. Multicellular interactions in the tumor microenvironment can lead to transient events including directional tumor cell motility and vascular permeability. Quantification of tumor vascular permeability has frequently used end-point experiments to measure extravasation of vascular dyes. However, due to the transient nature of multicellular interactions and vascular permeability, the kinetics of these dynamic events cannot be discerned. By labeling cells and vasculature with injectable dyes or fluorescent proteins, high-resolution time-lapse intravital microscopy has allowed the direct, real-time visualization of transient events in the tumor microenvironment. Here we describe a method for using multiphoton microscopy to perform extended intravital imaging in live mice to directly visualize multicellular dynamics in the tumor microenvironment. This method details cellular labeling strategies, the surgical preparation of a mammary skin flap, the administration of injectable dyes or proteins by tail vein catheter and the acquisition of time-lapse images. The time-lapse sequences obtained from this method facilitate the visualization and quantitation of the kinetics of cellular events of motility and vascular permeability in the tumor microenvironment. Dissemination of tumor cells from the primary mammary tumor has been shown to involve not only tumor cells, but host stromal cells including macrophages and endothelial cells. Furthermore, tumor vasculature is abnormal with increased permeability1. Thus, determining how tumor cells, macrophages and endothelial cells interact to mediate vascular permeability and tumor cell intravasation in the primary tumor microenvironment is important for understanding metastasis. Understanding the kinetics of vascular permeability, tumor cell intravasation and the underlying signaling mechanism of multicellular interactions in the tumor microenvironment can provide crucial information in the development and administration of anti-cancer therapies. The primary means of studying tumor vascular permeability in vivo has been the measurement of extravascular dyes such as Evans blue2, high molecular weight dextrans (155 kDa)3 and fluorophore or radiotracer-conjugated proteins (including albumin)4 at fixed time points after injection of the dye. Advancements in microscopy, animal models and fluorescent dyes have enabled the visualization of cellular processes and vascular permeability in live animals through intravital microscopy5. Live animal imaging with the acquisition of static images, or short time-lapse sequences over several time points does not allow for the complete understanding of dynamic events in the tumor microenvironment6,7. Indeed, static image acquisition over the course of 24 hr demonstrated that tumor vasculature is leaky, however the dynamics of vascular permeability was not observed6. Thus, extended continuous time-lapse imaging up to 12 hours captures the kinetics of dynamic events in the tumor microenvironment. This protocol describes the use of extended time-lapse multiphoton intravital microscopy to study dynamic multicellular events in the tumor microenvironment. Multiple cell types in the tumor microenvironment are labeled with injectable dyes or by using transgenic animals expressing fluorescent proteins. Using a tail vein catheter vascular dyes or proteins can be injected after the start of imaging to acquire kinetic data of multicellular events in the tumor microenvironment. For live cell imaging the mammary tumor is exposed through the surgical preparation of a skin flap. Images are acquired for up to 12 hours using a multiphoton microscope equipped with multiple photomultiplier tubes (PMT) detectors8. By using appropriate filters, a subtraction algorithm enables 4 PMT detectors to acquire 5 fluorescent signals in the tumor microenvironment simultaneously9. High-resolution multiphoton intravital microscopy captures single cell resolution imaging of tumor-stroma interactions in the tumor microenvironment, leading to a better understanding of vascular permeability and tumor cell intravasation10-13. Specifically, extended intravital imaging revealed highly localized, transient vascular permeability events that occur selectively at sites of interaction between a tumor cell, a macrophage and an endothelial cell (defined as the Tumor MicroEnvironment of Metastasis, TMEM14)13. Furthermore, tumor cell intravasation occurs only at TMEM and is spatially and temporally correlated with vascular permeability13. Single cell resolution of the dynamics of these events was made possible through the use of extended time-lapse multiphoton microscopy of fluorescently labeled cells in the tumor microenvironment. All procedures described must be performed in accordance with guidelines and regulations for the use of vertebrate animals, including prior approval by the Albert Einstein College of Medicine Institutional Animal Care and Use Committee. Generate fluorescently labeled tumor cells by crossing the spontaneous, autochthonous, genetically engineered mouse mammary cancer model where the mouse mammary tumor virus long terminal repeat drives the polyoma middle T antigen (MMTV-PyMT) with transgenic mice with fluorescent reporters [i.e., enhanced green fluorescent protein (EGFP), enhanced cyan fluorescent protein (ECFP) or Dendra2]8,9. Fluorescently label macrophages in PyMT animals with fluorescently labeled tumor cells by crossing genetically engineered mouse models with myeloid- and macrophage- specific fluorescent reporters [i.e., MacGreen15 or MacBlue mice Csf1r-GAL4VP16/UAS-ECFP16] . Alternatively, generate fluorescently labeled tumors through orthotopic transplantation of fluorescently labeled PyMT tumor cells (syngeneic), human breast cancer cell lines or primary human patient derived tumors (xenografts)11,17. Implant fluorescently labeled PyMT tumor cells into syngeneic mice with fluorescent protein-labeled myeloid cells to generate animals with fluorescently labeled tumor cells and myeloid cells13. Inject 100 µl of 10 mg/kg fluorescent 70 kDa dextran by intravenous (i.v.) tail vein into severe combined immunodeficiency (SCID) mice with xenograft tumors of human cell lines or patient-derived primary tumors to fluorescently label macrophages 2 hr prior to the start of intravital imaging. Note: This procedure describes the set-up for intravital imaging on a multiphoton microscope8. Turn on all microscope and laser components including two-photon lasers and the detectors. Turn on the heating box to 30 °C to pre-warm the stage. This step is critical for maintaining the physiological temperature of the animal. For use on an inverted microscope place the custom-made stage insert on the microscope stage. The custom insert is a sheet of 1/8" thick aluminum machined to fit in the stage insert space and with a 1" diameter through-hole in the center for imaging. Wipe the microscope stage and stage insert with 70% ethanol and air dry. Place a large drop of water on the 20X, 1.05 NA microscope objective to maintain optical contact with the cover glass. Place cover glass (#1.5 thickness) over the imaging port on the microscope stage insert. Secure in place with lab tape. Use a hole punch to punch a 2 cm x 2 cm hole in a flexible rubber pad and place the rubber pad on the microscope stage with the hole in the pad aligned with the hole in the custom stage insert. Cut a 30 cm length of polyethylene (PE) tubing. Using forceps, move the metal needle of a 31 G needle back and forth until it breaks off of the plastic fitting. Using forceps, insert the blunt end of the detached needle into the PE tubing. Insert a 31 G needle into the other end of the PE tubing. Fill a 1 cc syringe with sterile phosphate buffered saline (PBS) and insert it into the 31 G needle and flush all air out of the tubing and needle with PBS. PBS is used for maintaining hydration and blood osmolarity9,18, however isotonic saline may also be used. Fill a 1 cc syringe with 200 µl of 3 mg/kg 155 kDa dextran-tetramethylrhodamine (TMR) or quantum dots for vascular labeling. Prepare any other injectable proteins such as a 165 amino acid isoform of vascular endothelial growth factor A (VEGFA165) in a 1 cc syringe and place on ice. Inject 0.2 mg/kg VEGFA16519 at a concentration of 0.05 mg/ml. Place the animal under anesthesia using an induction chamber with 5% isoflurane with O2 as the carrier gas. Transfer the mouse to the surgical platform once it is fully anesthetized and does not respond to a toe pinch. Open isoflurane anesthesia line to the surgical platform, close the anesthesia line to the induction chamber and place the nose cone over the animal's snout. Reduce the isoflurane from 5% to 2.5%. Apply ophthalmic ointment to the eyes of the mouse to prevent dryness during anesthesia. Heat the animal under the heating lamp for an additional 2 min to increase circulation in the tail as circulation slows with deep anesthesia. Sterilize the mouse tail vein with 70% ethanol. Insert the tip of the 31 G needle from the catheter constructed in Section 3 into the lateral tail vein of the animal and push the needle in 2-3 mm. Pull back on the syringe to see blood, ensuring the catheter is placed in the tail vein. Use a 1 cm length of lab tape placed over the needle to hold the needle in place parallel to the vein along the length of the tail. With the animal on the surgical platform swab the tumor and the ventral surface with 70% ethanol. Note: As described, this procedure is not performed completely aseptically. For long imaging sessions where infection can become a confounding factor, it is recommended to use proper aseptic technique. Using sterile forceps, lift the ventral skin and with sterile scissors make a subcutaneous incision along the ventral midline approximately 1 cm in length. Avoid puncturing the peritoneum during the incision. Gently cut the connective tissue attaching the mammary gland and tumor away from the peritoneum to expose the mammary tumor. Using scissors and forceps, gently remove and cut away the fascia and fat from the exposed surface of the tumor while maintaining the integrity of the tumor vasculature and minimizing bleeding. This step is critical in maintaining the tumor architecture and vasculature supply of the tumor. Transfer the animal to the pre-warmed imaging stage with the exposed tumor placed on the coverslip on the stage insert over the microscope objective for imaging. Take care to transfer the tail vein catheter gently with the animal so as not to dislodge the needle. Place the anesthesia nose cone over the animal's snout to maintain anesthesia set to 3% isoflurane. Position the animal so that the tumor rests in the hole of the rubber pad and makes contact with the glass coverslip. Use two rubber pads to gently hold the tumor in place and fix them to the microscope stage with lab tape to reduce movement during image acquisition. Fill the chamber from the rubber pad with PBS to keep the tissue hydrated and maintain optical contact with the coverslip. Start monitoring the animal's vital signs with a pulse oximeter probe. Attach a clip sensor to the thigh of the animal. Alternatively a collar that is configured to fit around the neck can be used. Place the heating box over the animal to maintain 30 °C 20. Slowly reduce the level of isoflurane to 0.5-1% to maintain anesthesia and maintain blood flow. Using the microscope eyepiece focus on the fluorescent tumor cells on the surface of the tumor. Select an area of interest by finding areas with flowing blood vessels. The selection of an area of interest with flowing blood vessels is critical for assessing tumor vasculature. Once a region of interest has been selected switch the microscope into multiphoton imaging mode. Set the upper and lower limits of a z-series. Set the upper limit of the z-series by using the focus adjuster to move the objective to the desired start location and clicking on the Z position "Top" button. Determine the upper limit of the z-series by visualizing the collagen fiber network at the surface of the tumor in the second harmonic generation (SHG) channel and observing when no cells but only collagen fibers are visible. Set the lower limit of the z-series by moving the objective to the desired imaging depth (typically 50 - 150 µm) and clicking the Z position "Bottom" button. Set the step size by typing the desired value into the step size field. Determine step size based on considerations for resolution and acquisition time (typically 2 µm is used for high-resolution 3D reconstruction and 5 µm otherwise). Set the time-lapse interval by switching to the Time-Lapse panel and entering the desired lapse time into the Time-Lapse field. For optimal temporal resolution set the time interval to 0 sec for continuous imaging. Note: For long time-lapse imaging it is recommended to set the time interval to 10 sec between acquisitions to replenish the objective immersion liquid. Once the parameters for imaging have been determined, slowly inject 155 kDa dextran-TMR. Remove the syringe with PBS in the tail vein catheter and replace with the syringe containing 155 kDa dextran-TMR taking care not to introduce any bubbles into the line. Slowly inject 155 kDa dextran-TMR into the mouse, with a maximum volume of 200 µl, and replace the syringe with syringe containing PBS. CRITICAL STEP: Perform the injection slowly and take precautions to avoid getting solution outside of the vein. Start the acquisition of the Z-stack time-lapse imaging by clicking on the Z-Stack and Time-Lapse buttons to depress them and then clicking on the record button. If other fluorescent dextrans, i.e., 10 kDa dextran-fluorescein isothiocyanate (FITC), or proteins, i.e., VEGFA165, have been prepared in advance, inject them after the start of image acquisition for a t = 0 min start. Remove the syringe with PBS in the tail vein catheter and replace with the syringe containing 10 kDa dextran-FITC or VEGFA165 taking care not to introduce any bubbles into the line. Slowly inject injectables into the mouse through the tail vein catheter and replace the syringe with a syringe containing PBS. Every 30-45 min, slowly inject 50 µl of PBS or saline to maintain hydration of the animal. At the termination of image acquisition, euthanize the animal. Increase the isoflurane to 5%. Keep the animal under 5% isoflurane until 30 sec after it ceases to breathe and remove the animal from the stage. Perform cervical dislocation to ensure complete euthanasia. Acquire images at 16-bit TIFF files for each individual channel at each time point and save sequentially. Perform separation of spectral overlap (i.e., GFP and CFP), elimination of x-y drift and the generation of movies from time-lapse sequences using established methods in ImageJ9. Perform 3D surface reconstructions of high-resolution images13. Extended time-lapse intravital microscopy enables single cell resolution imaging of multicellular processes in the tumor microenvironment. By fluorescently labeling tumor cells, macrophages, the vascular space, and visualizing the collagen fiber network using the second harmonic generation signal, multiple compartments in the tumor microenvironment are simultaneously tracked during imaging. Tumor cells labeled with fluorescent proteins can be generated in transgenic mice as has been done in MMTV-PyMT-Dendra2 mice, with mammary tumor cells labeled with Dendra2 (Figure 1A). By crossing these transgenic mice with Csf1r-GAL4VP16/UAS-ECFP mice, which have macrophages labeled with ECFP, both tumor cells and macrophages are labeled in the MMTV-PyMT mice. With the dual labeling strategy of tumor cells and macrophages, the direct interaction of the two cells types can be visualized in real time (Figure 1A). Additionally, human breast cancer cells lines or patient-derived tumor cells transduced with GFP can be used to label tumor cells. Macrophages can be labeled using fluorescently labeled 70 kDa dextran which accumulates in the phagocytic macrophages (Figure 1B). These methods have promoted the study of dynamic multicellular events such as tumor cell-macrophage streaming motility, vascular permeability and tumor cell intravasation. To visualize changes in tumor vascular permeability, a fluorescently labeled high molecular weight dextran (155 kDa or higher is recommended9,13,21,22) or quantum dots are used to label the vascular space (Figure 1). 155 kDa dextran or quantum dots are large enough that they do not readily diffuse through the interendothelial spaces23. Continuous high-resolution imaging facilitates the capture of vascular permeability events and the quantification of the kinetics of dextran extravasation and clearance at TMEM (Figure 2 and Movie 1). Since the vascular space is readily defined by the 155 kDa dextran at the initiation of the time-lapse sequence (as in 0' of Figure 2) extravascular fluorescent dextran can be quantified in each frame of the time-lapse sequence. Figure 2 and Movie 1 demonstrate the extravasation of 155 kDa dextran-TMR injected through a tail vein catheter into a MMTV-PyMT-Dendra2; Csf1r-CFP mouse. Dendra2-labeled tumor cells (green) and CFP-labeled macrophages (cyan) are used to identify TMEM in live animals. The TMEM structure at the site of vascular permeability is outlined in a white box. 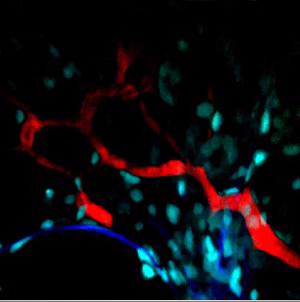 The vascular space is labeled with 155 kDa dextran-TMR (red) to visualize flowing vasculature and extravasation of vascular contents during events of vascular permeability. The peak of 155 kDa dextran-TMR extravasation in Figure 2 is seen between 29' and 34'. Extravascular dextran is seen at the white arrowhead in the top panels and at the red arrowhead in the lower panels, showing only the channel of the 155 kDa dextran-TMR. The 155 kDa dextran-TMR clears from the tissue and is seen as a decrease in the extravascular TMR signal as seen at 97' in Figure 2. After compilation of the time-lapse sequence in ImageJ extravascular dextran is quantified. In addition to observing spontaneous events in the tumor microenvironment, it is important to study the underlying molecular mechanism of the identified phenomena. Injecting additional vascular dyes or proteins to induce vascular permeability can provide insight into the signaling events regulating vascular permeability. Figure 3 demonstrates the difference in extravasation of 10 kDa dextran-FITC (green) and 155 kDa dextran-TMR (red). High molecular weight 155 kDa dextran-TMR is administered immediately before the start of time-lapse imaging. Five Z-stacks are acquired in the time-lapse sequence to set a baseline before 10 kDa dextran-FITC is injected. After acquisition of the 5th Z-stack the 10 kDa dextran-FITC is administered through the tail vein catheter without interrupting image acquisition. The dextran-FITC is seen entering the vasculature with immediate extravasation while the 155 kDa dextran-TMR remains confined to the vascular space (Figure 3, 0' and 6'). The 10 kDa dextran-FITC completely extravasates from the blood vessel and clears from the tissues leaving the 155 kDa dextran-TMR in the blood vessel (Figure 3 as seen at 56' and Movie 2). Using a time point from before injection, the kinetics of 10 kDa dextran-FITC extravasation can be readily compared to 155 kDa dextran-TMR13. The immediate extravasation of 10 kDa dextran-FITC after injection is significantly different from the retention of 155 kDa dextran-TMR in the vasculature and the spontaneous vascular permeability events13. Additional experimental controls can be performed including inducing vascular permeability through the mechanical disruption of the endothelium or through VEGFA165-mediated permeability13. The kinetics of extravasation of 155 kDa dextran-TMR of spontaneous permeability events can be compared to 10 kDa dextran, and other means of inducing vascular permeability to understand the events and signals involved in vascular permeability events in the tumor microenvironment. Figure 1. Strategies for labeling cells and the vasculature in the tumor microenvironment. (A) Transgenic MMTV-PyMT mouse with tumor cells labeled with Dendra2 (MMTV-iCre/CAGCAT-Dendra2/MMTV-PyMT) and macrophages labeled with CFP (Csf1r-GAL4VP16/UAS-ECFP). Tumor vasculature is labeled with 155 kDa dextran-TMR administered by tail vein catheter. (B) TN1-GFP patient-derived xenograft tumors with macrophages labeled with 70 kDa dextran-Texas Red and vasculature labeled with quantum dots using the tail vein catheter. Scale bar, 50 µm. Please click here to view a larger version of this figure. Figure 2. Visualizing transient vascular permeability. (A) Intravital microscopy (IVM) time-lapse of 155 kDa dextran-TMR (red) extravasation and tumor cell intravasation at TMEM (white box). Tumor cells labeled with Dendra2 (green, TC), macrophages with ECFP (cyan, M) and blood vessels with 155 kDa dextran-TMR (red, BV). Blood vessel permeability sites (white arrowhead). (B) Isolated 155 kDa dextran-TMR channel. Red arrows mark dextran extravasation (white). Scale bar, 50 µm. Movie of time-lapse microscopy in Movie 1. Please click here to view a larger version of this figure. Figure 3. Visualizing multiple fluorescently labeled dextrans. IVM time-lapse of difference in extravasation of 155 kDa dextran-TMR (red) and 10 kDa dextran-FITC (green). Macrophages are labeled with ECFP (cyan) and collagen in blue (SHG). The overlay of red 155 kDa dextran-TMR and green 10 kDa dextran-FITC in the vasculature is yellow. Rapid extravasation of green 10 kDa dextran-FITC peak is at 6 min. Scale bar, 50 µm. Movie of time-lapse microscopy in Movie 2. Please click here to view a larger version of this figure. Cellular interactions that occur spontaneously in the tumor microenvironment can lead to changes in tumor cell motility and intravasation. High-resolution intravital imaging of live tumor tissue permits the visualization of multi-cellular dynamics that can be highly transient10,13,24. End-point in vivo assays or time-lapse images acquired with discrete time points can provide essential information on molecular mechanisms of processes in the tumor microenvironment. Intravital imaging studies have been used to study processes in the tumor microenvironment that occur over several days, generating new insights on angiogenesis, tumor cell migration and response to drug treatment25-30. However, these assays might not capture the kinetics of transient events in the tumor microenvironment due to the time scale of the processes being studied7,31. Distinguishing multiple transient events from constant processes is a significant advantage of intravital microscopy. The intravital imaging technique described in this protocol enables the direct visualization of cellular dynamics in the tumor microenvironment by fluorescence labeling of multiple cell lineages and structures. Multiphoton microscopy permits greater depth of imaging over single-photon confocal microscopy with depths of 300 µm routinely performed24. Acquisition of Z-stacks of 50 - 100 µm with 2 µm steps is of high enough resolution to generate 3D reconstruction of cellular interactions, including protrusions that cells make as they extend towards each other13 and vascular structures in the tumor microenvironment. Movies and 3D reconstructions from time-lapse image sequences allow for the quantitation of cellular motility (speed and directionality) and, using changes in fluorescent signal intensity of injectable dyes, vascular permeability. In order to capture spontaneous cellular events the number of individual images captured in a single sequence must be optimized to allow for a rate of image acquisition that captures the kinetics of the event, but that also covers a sufficient physical space to increase the probability of capturing any individual event during a single time-lapse sequence. The spatial imaging parameters that need to be considered include; the number of slices in a Z-stack, the number of fields of view with Z-stacks acquired and the axial distance between individual slices in a Z-stack. Therefore, setting these parameters before starting image acquisition is a critical step in the protocol. Using the multiphoton microscope, acquisition of 30 frames (500 µm x 500 µm) in a z-series is approximately 60 sec. Since the duration of observed tumor cell intravasation can be on the order of minutes13, capturing several Z-stacks for 3D reconstruction of intravasation, the acquisition time of a Z-stack was limited to 60 sec. Therefore, a single field of view with up to 30 slices in a Z-stack was acquired. Furthermore, since 3D reconstruction of cells was desired, the axial step between Z-slices was set at 2 µm. This allows for sufficient information on cell volumes to allow for 3D reconstruction. These parameters must be optimized for any microscope and imaging software used based on the kinetics of the live events being studied. The modification of the rubber pad on the microscope stage and the tail vein i.v. catheter have both allowed for a significant increase in imaging time. The rubber pad forms a well to allow for maintained hydration of the tumor while minimizing XY drift on the glass coverslip. The combination of the heating chamber with the administration of PBS maintains hydration and physiological temperature of animals. These conditions combined maintain vascular perfusion and blood flow to allow for extended imaging of cellular events at the tumor vasculature including vascular permeability and tumor cell intravasation. A limitation of this technique is the number of fluorescent labels that can be used to visualize cells in the tumor microenvironment. Generating transgenic mice with additional cell types (i.e., endothelial cells, fibroblasts or pericytes) containing fluorescent protein can be difficult and time consuming. However, future potential applications could utilize a combination of fluorescent protein labeling of stromal cell types with implanted tumor cells and 70 kDa dextran labeling of macrophages. By using a combination of these labeling strategies and crossing transgenic mice new combinations of cellular labels can be generated to assess cellular movement and events in the tumor microenvironment. Unlike end-point experiments based on immunofluorescence staining, high-resolution intravital microscopy permits the visualization of spontaneous and transient events in the tumor microenvironment. The intravital imaging procedure described here reveals new events and cellular interactions in the tumor microenvironment that cannot be deciphered from static images. With novel information on the interacting cells types or processes, and the kinetics of these events, hypotheses can be generated to investigate the signaling pathways that drive these interactions. This research was supported by the Department of Defense Breast Cancer Research Program under award number (A.S.H, W81XWH-13-1-0010), NIH CA100324, PPG CA100324, and the Integrated Imaging Program. Polyethylene micro medical tubing Scientific Commodities Inc BB31695-PE/1 0.28 mm I.D. x 0.64 mm O.D. Microscope Olympus The microscope is a custom built two laser multiphoton microscope based on an Olympus IX-71 stand utilizing a 20X 1.05NA objective lens. Gerlowski, L. E., Jain, R. K. Microvascular permeability of normal and neoplastic tissues. Microvasc Res. 31, (3), 288-305 (1986). Wang, H. -L., Lai, T. W. Optimization of Evans blue quantitation in limited rat tissue samples. Sci Rep. 4, (2014). Dvorak, H. F. Rous-Whipple Award Lecture. How tumors make bad blood vessels and stroma. Am J Pathol. 162, (6), 1747-1757 (2003). Nagy, J. A., et al. Permeability properties of tumor surrogate blood vessels induced by VEGF-A. Lab Invest. 86, (8), 767-780 (2006). Egawa, G., et al. Intravital analysis of vascular permeability in mice using two-photon microscopy. Sci Rep. 3, (2013). Yuan, F., et al. Vascular permeability in a human tumor xenograft: molecular size dependence and cutoff size. Cancer Res. 55, (17), 3752-3756 (1995). Dellian, M., Yuan, F., Trubetskoy, V. S., Torchilin, V. P., Jain, R. K. Vascular permeability in a human tumour xenograft: molecular charge dependence. Br J Cancer. 82, (9), 1513-1518 (2000). Entenberg, D., et al. Setup and use of a two-laser multiphoton microscope for multichannel intravital fluorescence imaging. Nat Protocols. 6, (10), 1500-1520 (2011). Entenberg, D., et al. Imaging tumor cell movement in vivo. Curr Protoc Cell Biol. Chapter. 19, (2013). Patsialou, A., et al. Intravital multiphoton imaging reveals multicellular streaming as a crucial component of in vivo. cell migration in human breast tumors. Intravital. 2, (2), e25294 (2013). Gligorijevic, B., Bergman, A., Condeelis, J. Multiparametric classification links tumor microenvironments with tumor cell phenotype. PLoS Biol. 12, (11), e1001995 (2014). Roussos, E. T., et al. Mena invasive (MenaINV) promotes multicellular streaming motility and transendothelial migration in a mouse model of breast cancer. J Cell Sci. 13, 2120-2131 (2011). Harney, A. S., et al. Real-Time Imaging Reveals Local, Transient Vascular Permeability, and Tumor Cell Intravasation Stimulated by TIE2hi Macrophage-Derived VEGFA). Cancer Discov. 5, (9), 932-943 (2015). Robinson, B. D., et al. Tumor microenvironment of metastasis in human breast carcinoma: a potential prognostic marker linked to hematogenous dissemination. Clin Cancer Res. 15, 2433-2441 (2009). Sasmono, R. T., et al. A macrophage colony-stimulating factor receptor-green fluorescent protein transgene is expressed throughout the mononuclear phagocyte system of the mouse. Blood. 101, (3), 1155-1163 (2003). Ovchinnikov, D. A., et al. Expression of Gal4-dependent transgenes in cells of the mononuclear phagocyte system labeled with enhanced cyan fluorescent protein using Csf1r-Gal4VP16/UAS-ECFP double-transgenic mice. J Leukcocyte Biol. 83, (2), 430-433 (2008). Liu, H., et al. Cancer stem cells from human breast tumors are involved in spontaneous metastases in orthotopic mouse models. Proc Natl Acad Sci U S A. 107, (42), 18115-18120 (2010). Nakasone, E. S., Askautrud, H. A., Egeblad, M. Live imaging of drug responses in the tumor microenvironment in mouse models of breast cancer. J Vis Exp. (73), (2013). Weis, S., Cui, J., Barnes, L., Cheresh, D. Endothelial barrier disruption by VEGF-mediated Src activity potentiates tumor cell extravasation and metastasis. J Cell Biol. 167, (2), 223-229 (2004). Wyckoff, J., Gligorijevic, B., Entenberg, D., Segall, J., Condeelis, J. High-Resolution Multiphoton Imaging of Tumors. In Vivo. Cold Spring Harb Protoc. (10), (2011). Lathia, J. D., et al. Direct in vivo. evidence for tumor propagation by glioblastoma cancer stem cells. PLoS One. 6, (9), e24807 (2011). Nakasone, E. S., et al. Imaging tumor-stroma interactions during chemotherapy reveals contributions of the microenvironment to resistance. Cancer Cell. 21, (4), 488-503 (2012). Dreher, M. R., et al. Tumor vascular permeability, accumulation, and penetration of macromolecular drug carriers. J Natl Cancer Inst. 98, (5), 335-344 (2006). Wyckoff, J. B., et al. Direct visualization of macrophage-assisted tumor cell intravasation in mammary tumors. Cancer Res. 67, (6), 2649-2656 (2007). Chittajallu, D. R., et al. In vivo. cell-cycle profiling in xenograft tumors by quantitative intravital microscopy. Nat Methods. 12, (6), 577-585 (2015). Kedrin, D., et al. Intravital imaging of metastatic behavior through a mammary imaging window. Nat Methods. 5, (12), 1019-1021 (2008). Yano, S., et al. Spatial-temporal FUCCI imaging of each cell in a tumor demonstrates locational dependence of cell cycle dynamics and chemoresponsiveness. Cell Cycle. 13, (13), 2110-2119 (2014). Yang, M., Jiang, P., Hoffman, R. M. Whole-body subcellular multicolor imaging of tumor-host interaction and drug response in real time. Cancer Res. 67, (11), 5195-5200 (2007). Manning, C. S., et al. Intravital imaging reveals conversion between distinct tumor vascular morphologies and localized vascular response to Sunitinib. Intravital. 2, (1), 24790 (2013). Alexander, S., Koehl, G. E., Hirschberg, M., Geissler, E. K., Friedl, P. Dynamic imaging of cancer growth and invasion: a modified skin-fold chamber model. Histochem Cell Biol. 130, (6), 1147-1154 (2008). Brown, E. B., et al. In vivo. measurement of gene expression, angiogenesis and physiological function in tumors using multiphoton laser scanning microscopy. Nat Med. 7, (7), 864-868 (2001).